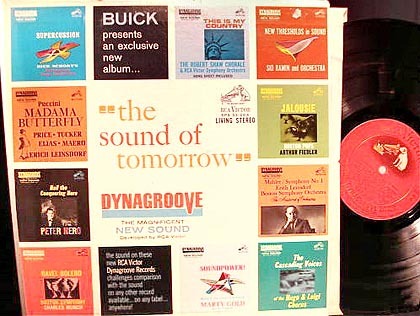 In 1963, RCA introduced a set of enhancements to its LP record-making process under the trademark, “Dynagroove.” It was heralded as “adding brilliance and clarity, realistic presence, full-bodied tone and virtually eliminating surface noise and inner groove distortion.” However, it was criticized as early as 1963 by J. Gordon Holt in Stereophile magazine. He sniffed, “[It is] nothing more than a sophisticated way of bringing higher fi to record buyers who don’t care enough about hi-fi to invest in a decent playback system.” Although I recall a high public regard for Dynagroove in that era, today, one can find quite a few negative comments posted about it on the Net. I suspect that those stem in part, from the original criticisms by Holt. It could also be that some of the processing used in the system is no longer optimum, for the playback equipment used today (see below). I was curious to see if the attacks of the audio elite were fully justified, so I turned to Dr. Harry Olson’s paper describing the Dynagroove system. It appeared in the April 1964 issue of the Journal of the Audio Engineering Society. New studios, with controlled attack and decay characteristics. Microphone placement based on controlled, subjective testing. guard against overloading the master tape. New magnetic tape recorders with higher overload points. Recording at 30ips instead of the conventional 15ips. Development of a new magnetic tape formulation, with higher retentivity, lower noise level, higher coercivity and a heavier base material. Sophisticated Recording Overload Indicator to guard against exceeding the limits allowable for cutting the master disk. Dynamic Styli Correlator (DSC), which canceled tracing distortion, due to a 0.7mil playing stylus. It was stronger at high frequencies and at the inner grooves. Optimization of vertical tracking angle in the disk cutter. New, higher-power disk cutting amplifiers to reduce distortion. Reduction of noise in the master lacquer disk by maintaining constant temperature of the cutting stylus. Improvements in the plating process used to produce final stampers from the master disk, resulting in higher signal-to-noise ratio. Perhaps the most controversial part of the Dynagroove system was the Dynamic Spectrum Equalizer (DSE). It was a variable filter which boosted low frequencies at low levels and boosted high frequencies at high levels. Another way to view it is: There was dynamic range compression at low frequencies and expansion at high frequencies. The processing was intended to compensate for the masking effect of room noise, for changes in the ear’s frequency sensitivity over level and for the reverberation characteristics of the average home. It’s not surprising that this didn’t appeal to audio purists. I would agree with them, that I would prefer not to have my audio processed this way. Nevertheless, I recognize that there was real research which argued for it. I am sorry to have to admit that, comparing the CD and Dynagroove LP versions of one selection from 1963, the LP version sounded better. It was more dynamic and brighter than the CD. That prompted my interest, which led to this article. It was a brief comparison. If I were to compare more material, perhaps my opinion would change as to whether the LP sounds better. In any case, I definitely would prefer my music to be unprocessed, in that sense. But there is another factor to consider: Most LP recordings needed some general compression to sound good. I have always (reluctantly) accepted that. The dynamic range of a symphony orchestra simply exceeds the usable dynamic range of an LP by too much. Given that the overall dynamic range had to be somewhat compressed, was there any way to restore some of the dynamics? Have you ever noticed that after listening to loud music for a while, it no longer seems loud? The ear adjusts and much of what we perceive as dynamic range is what occurs over relatively short time periods (say several seconds) rather than minutes. The DSE was a dynamic range expander for the upper frequency range. It restored some of the short-term dynamics for that part of the spectrum, since that part didn’t dominate overall power level. The result was that the effects of necessary overall compression were somewhat mitigated. Once again, personally, I would prefer the unprocessed version. But I would bet that most listeners, audiophiles included, would choose the Dynagroove version, if it were not identified as such. By 1963, it was well-known that the 0.7-mil stylus which was used to play LP’s, would cause a significant amount of distortion as the ball-shaped tip attempted to trace the path cut by the chisel-shaped cutter stylus. This is called tracing distortion. You cannot use a chisel-shaped stylus to play records, because it would put too much stress on the plastic and damage the grooves. The Dynagroove solution was to model the distortion and introduce an equal but opposite signal into the recording. This would cancel the tracing distortion, upon playback. Since the amount of tracing distortion gets worse towards the inner grooves, the compensation had to vary with cutter head position. According to test data presented, the DSC worked very well. However, DSC is now criticized for the fact that it was optimized for a 0.7-mil playback stylus and elliptical styli (typically 0.7 x 0.3-mil) are common today. Yet, it is not clear whether playback with the non-optimum elliptical stylus will incur more distortion than if the DSC were not used at all. That is an interesting topic for investigation. In any case, the 1963 Allied Radio catalog did not list any cartridges with elliptical styli, though many big names such as Shure, Empire, Pickering, Stanton and others appear. The elliptical stylus had been invented by Edison around the turn of the century but it would be some time before it was rediscovered and became common in home stereo systems. So the DSC part of Dynagroove was a real advance in the state of the art at the time. Whether it helps or hurts today, is an open question. Other than DSE and DSC, all of the changes introduced in the Dynagroove system were unquestionably positive developments in producing high-quality LP records. Although DSE does cause controversy, it would seem to be unfair to ignore the many real enhancements that the system brought and to dismiss all of the excellent Dynagroove recordings which were made. If J. Gordon Holt were still here I would kick him in the balls for being instrumental in criticizing Dynagroove. I have a full reference stereo and the old Dynagroove records come the closest to a live orchestra of any records I own and I own thousands etc.. I don’t give a damn about flaunting my system or its equipment. All I care about is the music. I don’t care if its a $200 speaker or a $200,000 speaker. Dismissing Dynagroove was one of the stupidest things ever done. Yes, I love all my Command records from 35mm tape and the Phase 4 are really good but a few of my Dynagrooves stand supreme in fidelity. Imagine, someone smart enough to take into consideration vinyls flaws and overcome them only to have some snotty audiophile claim, “ooh, you messed with the sound. I need my mommie equipment. Boo Hoo.” The height of lunacy? Yes, methinks so. Hi Robert, Thank you for posting about this -- I had not heard of Shure's May 1st announcement. Yes, it is surprising, given the amazing come-back of vinyl records, which has lasted over a decade now. The discontinuation of Shure's production is effective this summer. I still have a brand-new V15 Type V salted away, from when they had to discontinue that series due to beryllium fear. Looks like I'll need to stock an M97 or two now. While perennially, there have been higher priced alternatives to Shure cartridges, their line has always included near state of the art, yet rationally-priced products. Sad day indeed. This week Shure announced that it was discontinuing the manufacture of phonograph cartridges. I was quite surprised at this move, considering the resurgence in vinyl records and phonographs. Thank you for your kind comment, Jason! i have been buying all the Rca mono, Dynagroove, Rca red dog stereo/mono, and other classical labels i can get my hands on as well Vox, Angel blue mono stereo and westminister 50 and 60s its a very rewarding listening expeirence. Great Article! PS - Who are pressing these vinyl records nowadays? I'm sure they aren't coming out of the old RCA Victor record plant in Rockaway, NJ nor the old Command/Grand Award Record Company in Newark, NJ!